Hey guys! And a happy Tuesday to you! I'd like to share one of the photo editing tricks I use in Adobe Elements and Adobe Photoshop with all of you. One very popular vintage technique to add to your photographs involves adding a navy blue color fill layer and setting that layer to the "Exclusion" blending mode. Open the image to be edited. Adjust the lighting with the levels toolbar. Add a solid color layer by going to the top of the tool bar. Select layer-New Fill Layer-Solid Color. The color picker window will pop up. Pick a dark navy blue color. I use hex#70144, which is very close to black. However, feel free to chose your own custom color. Your image will now be completely dark navy blue. Now, set the color fill layer to "exclusion" and adjust the opacity. In the image above, I set the opacity to 60, but many times, I will keep it at 100. Leaving the opacity at 100 will give your photos a strong yellowing effect. Just play around with it and adjust the intensity to your liking. I then wanted to beef up the whites, so I added a new color fill, using steps #3 and 4, and set the color picker to hex#cccc99. I then set this layer to soft light with an opacity of 50. After that, under the layer tab, I selected, New Adjustment Layers-Levels and played around with the color gradients, particularly, moving the dark left hand triangle to the right to add more depth. Last, I flattened the layers and saved the image in JPEG format. Hope this was helpful. It's really simple to do and can greatly enhance your digital images. Play around with it, and develop a method and colors that work best for you! Oh you are the best Lauren!! Thanks for sharing!! Sounds so much easier. thanks so much for the info!! and i love those jeans! so fabulous, as always! Very fun! I just love playing with actions in Photoshop and creating fun effects to pictures...looks great! Boo, the picture turned out so beautiful....I am sad that I don't have Photoshop! Have you tried Picnik.com? 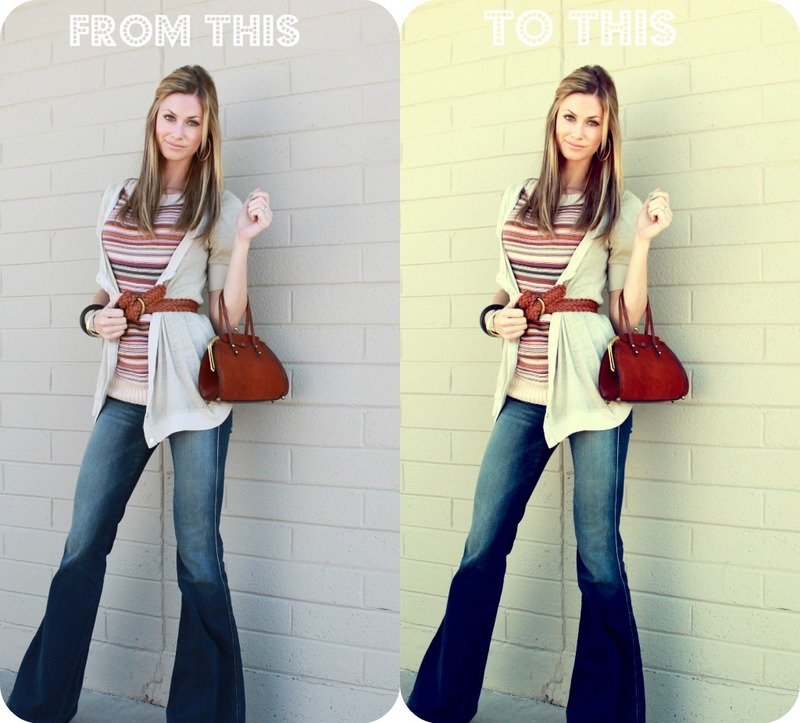 The Cross Process effect is very similar to what you did with photoshop (and it's free). I use the Cross Process effect in Picnik and get the exact same effect. Love your blog! Can you follow me too on google friend connect and bloglovin? I would greatly appreciate it! Have you ever used picnik? That's what I use and I was wondering if I could get a similar effect with it? Awesome tips, they make a huge difference! Thanks! WOW - makes a huge difference! Now I wish I had photoshop (boohoo). The '70s jeans are gorgeous!I follow u babe,if u like,follow me back on http://themissidea.blogspot.com/! 1. Love your blog - I'm a new follower. 2. You have some awesome tips - thanks for sharing. 3. I found you because of your hilarious comment on Megan's blog - why she should come back to the US... Excited to read more of your blog! love your style!!! and tnx for this editing tip! is there anything else you do with your raw pix? thanks so much for sharing this tip! i'm definitely bookmarking this one! just happened upon your blog and I love it. your tips are so helpful and friendly! thanks for sharing.